In multiple-time graphical analysis the radiopharmaceutical concentration curves of tissue region-of-interest and arterial plasma are transformed and combined into a single curve that approaches linearity when certain conditions are reached. The data could be plotted in a graph, and line can be fitted to the linear phase. The slope of the fitted line represents the net uptake rate of the radiopharmaceutical or volume of distribution. In some instances a reference region curve can be used as input function in place of arterial plasma input. The graphical analysis methods are independent of any particular model structure, although the slope can be interpreted in terms of a combination of model parameters for some model structure. Graphical analysis methods have been developed for reversibly and irreversibly binding radiopharmaceuticals (Logan, 2000 and 2003). Munk (2012) proposed using vi-plot to study at which time point the quasi steady state is reached, allowing the linear fitting of Logan or Patlak plots. 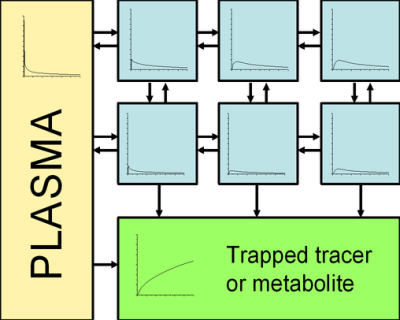 The original idea of Patlak and Blasberg was to create a model independent graphical analysis method: whatever the radiopharmaceutical is facing in the tissue, there must be at least one irreversible reaction or transport step, where the radiotracer or its labelled product cannot escape. It is assumed that all the reversible compartments must be in equilibrium with plasma, i.e. the ratio of the concentrations of radiopharmaceutical in plasma and in reversible tissue compartments must remain stable. In these circumstances only the accumulation of radiopharmaceutical in irreversible compartments is affecting the apparent distribution volume. In practise, this can happen only after the initial sharp concentration changes when the plasma curve (input function) descends slow enough for tissue compartments to follow. Figure 1. There can be any number of reversible compartments, where the radiopharmaceutical can come and go. After some time, radiopharmaceutical concentrations in these compartments start to follow the radiopharmaceutical concentration changes in plasma (ratio does not change). Then, any change in the total tissue concentration (measured by PET) per plasma concentration represents the change in irreversible compartment(s). If there is no irreversible binding in the tissue, the resulting Patlak plot becomes horizontal, with slope of zero. In this case MTGA for reversible uptake (Logan plot) could be applied instead to calculate the distribution volume. When the equilibrium is achieved, the Patlak plot becomes linear. The slope of the linear phase represents the net transfer rate Ki (influx constant). To make it simple, Ki represents the amount of accumulated radiopharmaceutical in relation to the amount of radiopharmaceutical that has been available in plasma. where linearity is achieved after the distribution volume of the reversible compartments, included in the intercept (Int) is effectively constant (Logan, 2000). The y axis of plot contains apparent distribution volumes, that is the ratio of concentrations of radiopharmaceutical in tissue and in plasma, as a function of time. On x axis is normalized plasma integral, that is the ratio of the integral of plasma concentration and the plasma concentration. This method was actually first applied by Rutland (1979), and then by Gjedde (1982), but formal representation of the analysis method was published by Patlak & Blasberg (1983 and 1985). Figure 2. Patlak plot becomes linear after the radiopharmaceutical concentrations in reversible compartments and in plasma are in equilibrium. The slope of the linear phase of plot is the net uptake (influx) rate constant Ki. Ki is in units min-1, or (mL tissue)/((mL plasma)*min). Note that although x axis has time units (min or sec), the values do not represent the PET sample times. 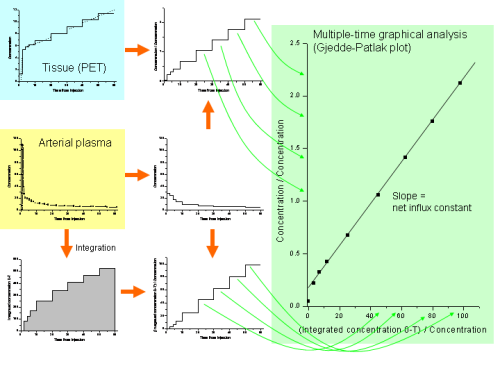 Patlak plot analysis requires that sufficiently long dynamic PET scan is performed, and that arterial plasma curve is measured starting from the radiopharmaceutical administration until the end of the PET scan. Blood sampling is not necessary, if the input function can be measured from the dynamic PET image. If two static late-scans can be performed, and input function can be measured from the PET images, then it may be possible to estimate Ki (and subsequently metabolic rate) from that dual time point (DTP) data alone (van den Hoff et al., 2013). If input function is derived from dynamic image, but scan was not started at administration time and input peak is thus missing, relative Patlak plot can be calculated, providing relative Ki image. Ki estimates are not quantitative, but comparable to true Ki values with a single scaling factor, and these parametric Ki images can be used in lesion detection and SPM (Zuo et al., 2018). In brain PET studies it may be possible to have a reference region where irreversible compartments do not exist: for example cerebellum in FDOPA studies. In FDG studies this is not possible because all brain regions consume glucose. Reference region contains only reversible compartments, which also achieve an equilibrium with plasma. The reference region can be included in the model, and the plasma curve is cancelled out (Patlak and Blasberg, 1985). In practise, the only difference to the calculation using plasma input is that plasma curve is replaced with reference region curve. with reference tissue input, assuming that K1/k2 is similar in region of interest and in reference region. If k3≫k2 (transport or perfusion is the limiting step), then the slope represents k2. Reference tissue input can be used also in analysis of dual time point data to calculate a surrogate parameter for Patlak Kiref. When the PET radiopharmaceutical is an analog of glucose (e.g. [F-18]FDG) or fatty acids (e.g. [F-18]FTHA) or other native substrate in the tissue, and it is metabolically trapped in tissue during the PET scan, the Ki can be used to calculate the metabolic rate of the native substrate. For example, in [F-18]FDG the Ki can be multiplied by the concentration of glucose in plasma, and divided by the appropriate lumped constant, to get an estimate of glucose uptake rate. where linearity is achieved after the intercept (Int) is effectively constant (Logan, 2000 and 2003). Tantawy et al. (2009) introduced a modified Logan plot for delayed scan protocols where the initial uptake of radiotracer is not measured. , but this formulation would achieve linearity only after the true steady state condition is reached (Logan 2003), and to keep imaging session as short as possible this is therefore not commonly used. Zhou et al (2009) reintroduced this formulation (as “new plot”), because it avoids the noise-induced negative biases in the VT and BPND estimates of the traditional Logan plot formulation.